Hellfire, Hail, and hello Saskatchewan! Hey everybody, I’m Graham and I’m a part of the BIObus team going to the west coast of Canada. This is my second trip on the bus, and I’m hoping it will be just as amazing as last year! It’s nice to be back on my mobile home away from home out in the field collecting bugs and admiring the amazing Canadian scenery. 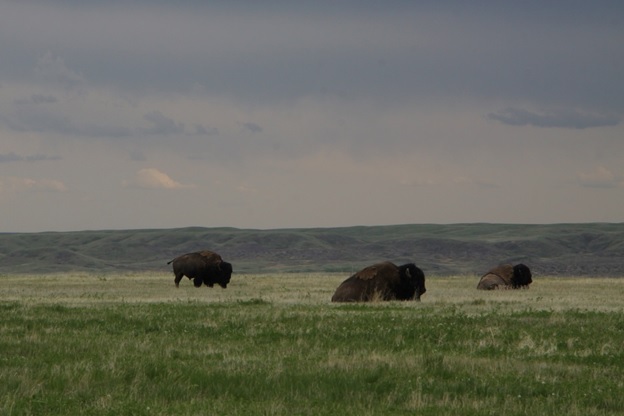 This is our second day in Grasslands National Park, and it has been pretty eventful. A snapshot from the eye of the hailstorm, something I’ve always wanted to see! We usually give our traps a day to collect after we set them up, so since we set them up yesterday we were free to do our own choice of collecting all day. We decided that we would first collect down the Rock Creek Trail (near out first trap site), determine if Hellfire Creek was wet or dry, do aquatic collecting in Rock Creek near the visitor center, then break for lunch. Afterwards we would hand collect more in the badlands, and finish up the day with an astronomy intro from the visiting club and deploy a few more sets of traps around the park. However, before we could even get to Hellfire Creek, a storm blew in from the west and brought about the end of our productivity. Soon after we got back to the bus, we got hit by a huge storm full of hail the size of gumballs that hit significantly harder than gumballs. Storms here can come in with amazing speed; we could just see the rain sheets on the horizon, but when we looked back it was almost on us! Apparently the people here get hail all the time, so they didn’t really think much of it. Unlike them, we were in shock and awe as the hail machine gunned down on us in our little RV. Needless to say it ended our plans a bit early, and the whole experience has given me a new phrase: “well, we can’t do anything, might as well eat cake!”. I picked it up when Brenda (one of the park staff) said it. We thought it was a quirky Saskatchewan saying, but she actually had cake from a party the hail had cancelled. Fresh Rock Creek Rhubarb Cake definitely improved our day! Setting up our site in the badlands. What a fantastic view! We hope our traps survived all of this, little plastic pans, netting, tents and all. We had to set them up a kilometer or more away from any trail, and they weren’t supposed to be visible from any of the trails, either. Now, to our readers at home, that must not sound very hard. And it wouldn’t be, if we were anywhere but Saskatchewan. It’s remarkably hard to hide anything when you can honestly see for miles, but it’s also such an eye opening experience for us city folk. For example, we watched a white tailed deer sprint away until it was a tiny dot on the horizon. For something so flat and scrubby, Grasslands is a beautiful place and I’m very glad I was able to come here and experience it. This is Graham, signing off!